Dairy Free Brownies with Caramel are going to become your new favourite paleo dessert. 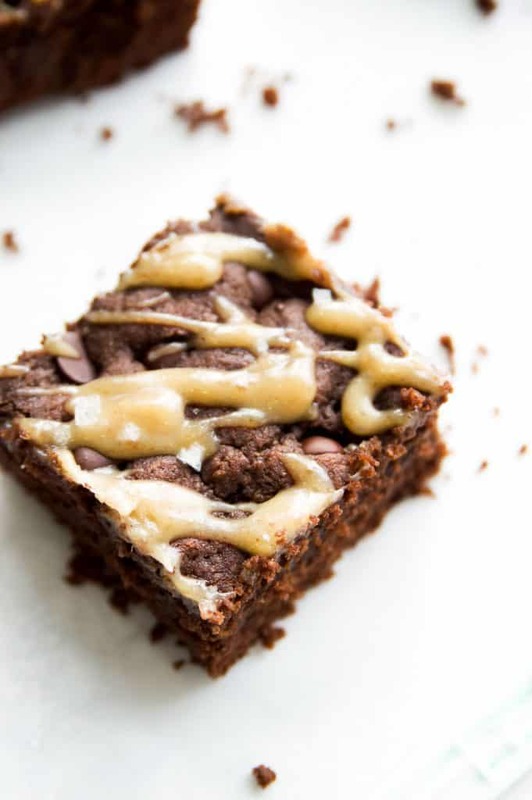 These dairy free brownies with caramel are easy to make, moist in the middle, and are both gluten and grain free. 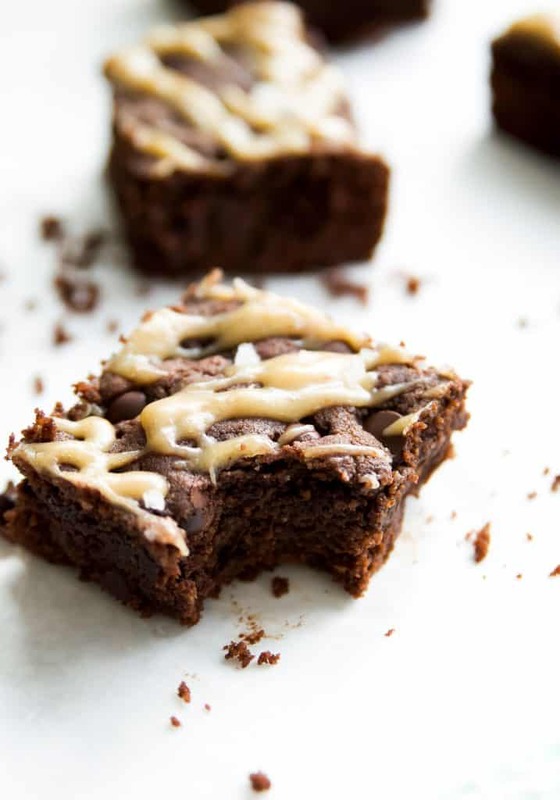 Made with almond flour and coconut flour your whole family will love these dairy free brownies with caramel. Do you love brownies? I LOVE brownies! My grandmother used to make the best brownies ever (at least in my humble opinion), but sadly, after I changed to the paleo diet I had to give up that amazing dessert. I have been on a mission to come up with a delicious paleo brownie recipe ever since, and I think I finally did it. 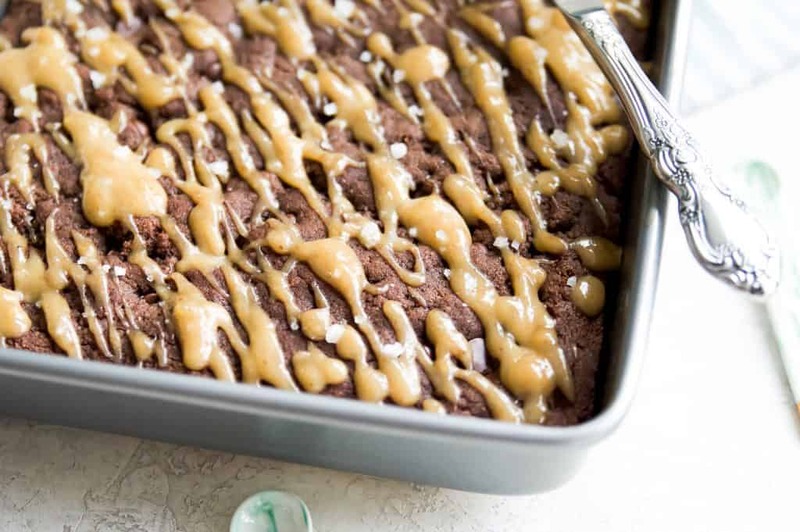 These Dairy Free Brownies with Caramel are incredible! So chocolatey, moist in the middle, and topped with an amazing caramel sauce. They are also surprisingly easy to make. 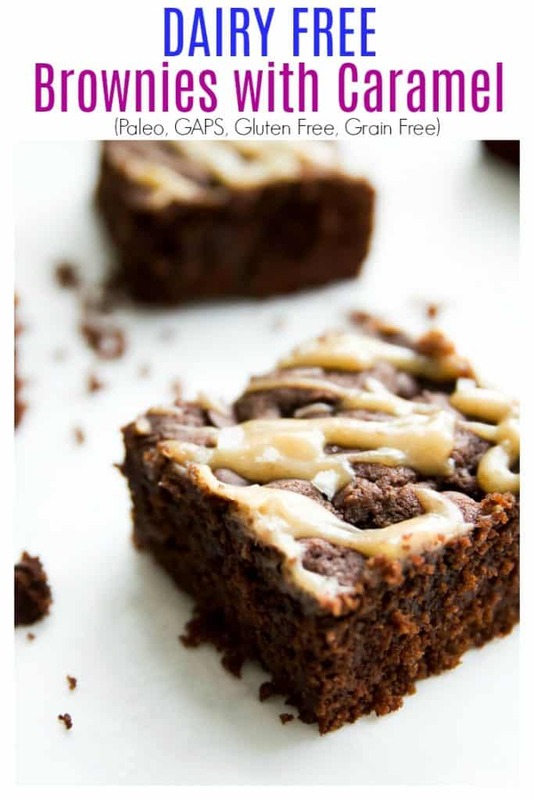 With Valentines Day coming up these Dairy Free Brownies with Caramel will make the perfect paleo treat. 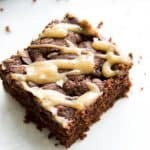 Pair these Dairy Free Brownies with Caramel with a glass of your favourite dairy free milk (coconut milk is my personal favourite) and you have the perfect paleo dessert. They don’t require any fancy ingredients. 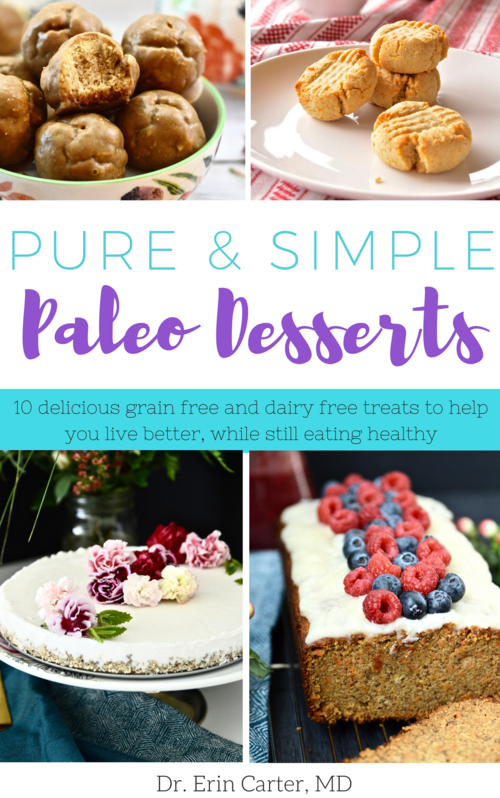 If you are used to paleo baking I bet you already have everything you will need in your pantry. The caramel sauce! I mean look how pretty that caramel drizzle is. Chocolate and caramel, is there any other better combination? I don’t think so! Grain free and dairy free baking can be tricky. 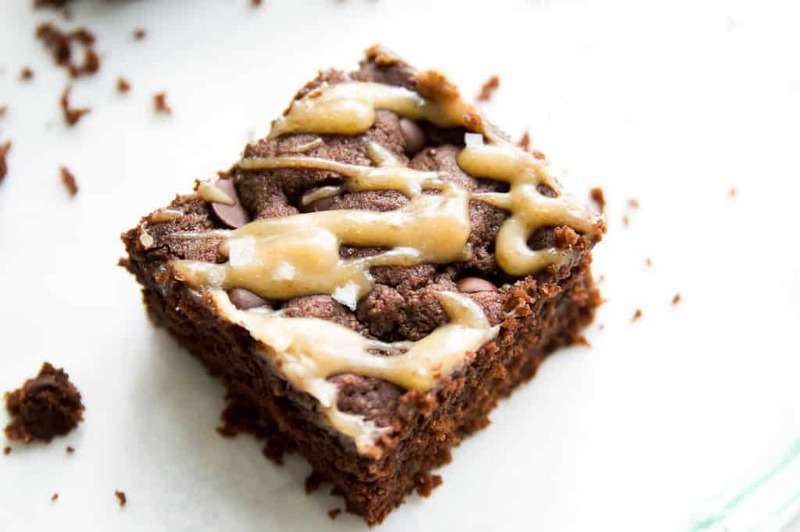 For these Dairy Free Brownies with Caramel I used a combination of both almond flour and coconut flour to give them the perfect consistency. I personally love this brand of almond flour and this brand of coconut flour. Some almond flours are not fine enough and so your recipes won’t turn out well if you don’t use the right brand. Trust me I’ve made that mistake before and was so angry that I wasted all that money (because almond flour is not cheap!). 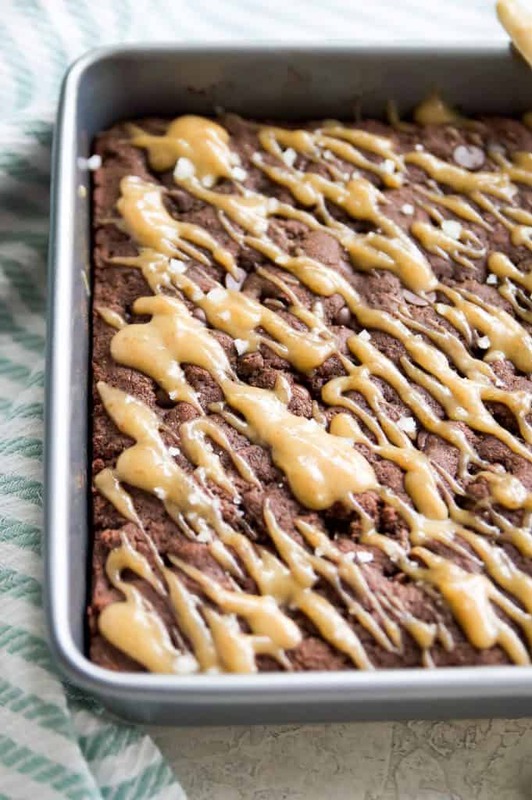 You’ll be so happy with how easy these dairy free brownies with caramel are to make. First, pre-heat your oven to 350F. Then you are going to add all of the ingredients (except the chocolate chips) to the bowl of your standing mixer. 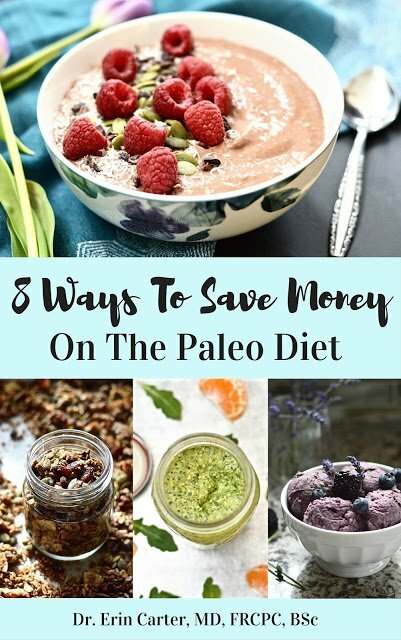 This includes the almond flour, cacao powder, coconut flour, baking soda, sea salt, eggs, coconut milk, cashew butter, coconut oil, honey and vanilla extract. Then blend the ingredients well until they are smooth. Next stir in the dairy free and soy free chocolate chips by hand. Then grease an 8 inch by 8 inch baking pan with coconut oil. Then transfer the dough to the pan and spread it out evenly. I find that wetting your hands really helps spread the dough evenly as it is quite thick and sticky (which is why they turn out so good!). Then you are going to bake the brownies for about 20 minutes, or until a toothpick inserted into them comes out clean. While the brownies are baking you can make the caramel sauce. Note that this makes a large batch of caramel sauce, so if you only want enough for the brownies I suggest cutting the recipe down by a quarter. All you need to do to make the caramel sauce is put all of the ingredients into your Vitamix or other high speed blender and then blend the ingredients until they are smooth. If you are interested, this is the Vitamix Blender that I personally use and LOVE! I don’t know how I survived without a Vitamix Blender in my kitchen before. My parents gave me mine as a gift for finishing residency and I have been using it regularly every since. Once the brownies are done baking, allow them to cool for about 10 minutes and then drizzle them with the caramel sauce. Let them cool for a bit longer and they are ready for you to enjoy! These keep really well in the fridge for up to a week (if you are able to keep them that long kudos to you!). Can you substitute the cashew butter with a different nut butter? Yes! Feel free to use almond butter or sunflower seed butter if you can’t have cashews. Can you omit the caramel sauce? Yes you totally can. Although I don’t think they taste as good. I mean, chocolate and caramel, is there anything better than that? Can you substitute the almond flour for coconut flour? Definitely not! Please don’t try this. The paleo brownies will be a dry, crumbly mess. Can you omit the eggs? No! I have also not tried this recipe with chia seed eggs, flax seed eggs or gelatin eggs. If you try it please let me know how it turns out but I can’t guarantee anything. 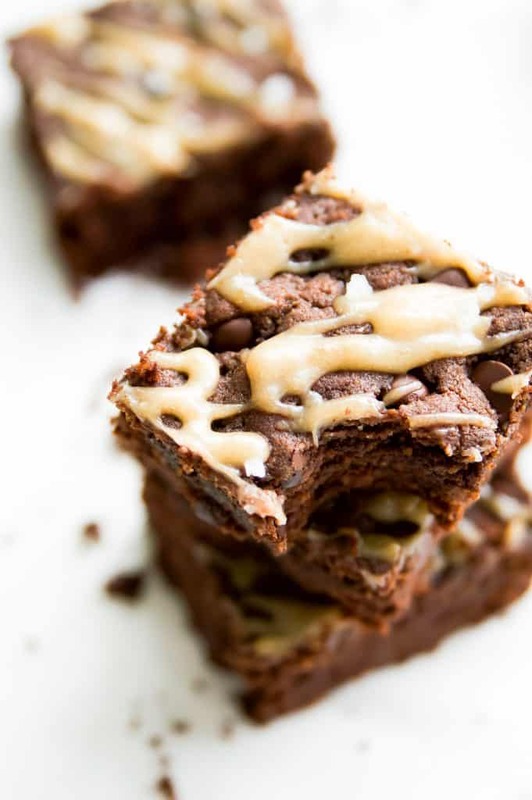 Are these dairy free brownies with caramel paleo friendly? Yes! These brownies are safe for the paleo diet. Are these dairy free brownies safe for the GAPS diet? Yes they are! As long as you have completed the re-introduction phases of the diet. You may need to omit the chocolate chips if you can’t find any that are GAPS legal (cane sugar is technically not allowed on the GAPS diet). DID YOU MAKE AND LOVE THIS RECIPE? 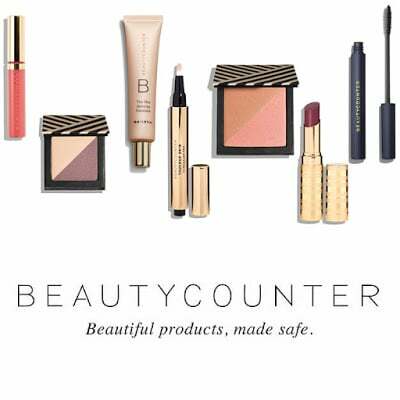 MAKE SURE TO LEAVE A COMMENT OR REVIEW BELOW. 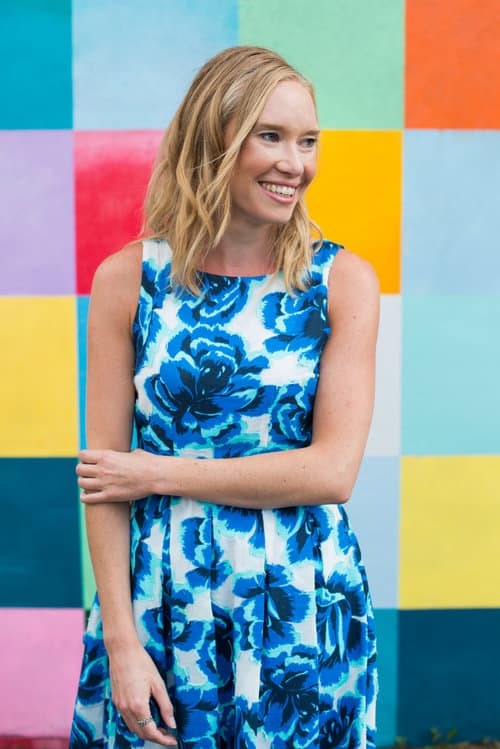 AND BE SURE TO SHARE YOUR CREATIONS BY TAGGING ME ON INSTAGRAM. Dairy free brownies with caramel are going to become your new favourite paleo dessert. Loaded with chocolate, moist in the middle and easy to make! 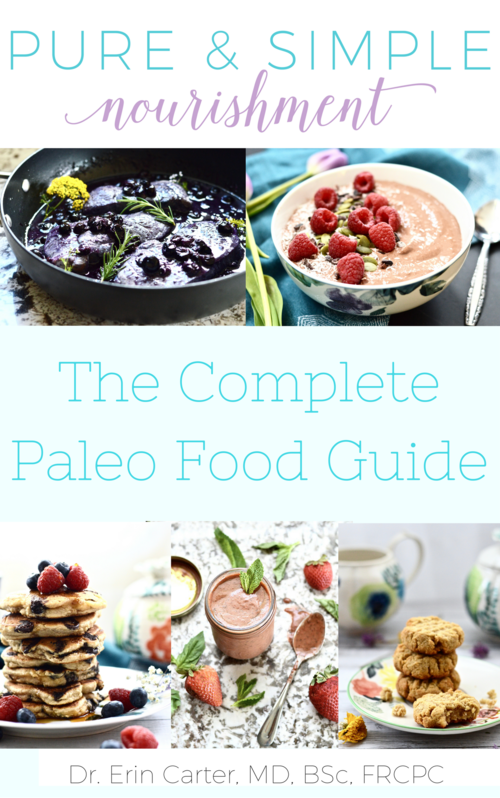 Note: If you are following the paleo diet make sure the chocolate chips you are using are dairy and soy free. You can substitute the cashew butter for almond butter or sunflower seed butter. The recipe for the caramel sauce makes a large batch of caramel. If you don’t want extra cut the recipe down by a quarter.